Whether you're travelling with your family, a friend, or travelling alone, our classes are great for everyone - for people of all ages and for all cooking levels. We have an incredible list of recipes including many for vegetarians and dessert lovers. 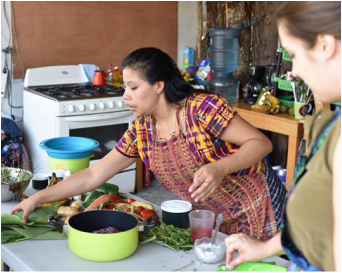 For 3-4 hours, you will get a lot of hands-on fun learning how to cook three authentic Guatemalan dishes. 4. The cooking adventure begins! ​Classes begin at 9AM and can be instructed in English or Spanish. We also offer private classes. We start with a little trip to the market to buy ingredients and to meet local vendors. Then we make our way to the kitchen to get cooking. You will be able to take home the recipes and share them with your family and friends. If you're passing through Lake Atitlán, the Mayan Kitchen is a perfect pitstop. Let us know which date fits your travel plans or contact us for more information!